Up until the mid 80s there was no such thing as a soft plastic stick bait . The lure , the concept and the technique used to fish them is new - not revamped , not a new bib design , colour , hook arrangement or a rediscovered way to fish an old lure but a new type of lure. Nearly every style of standard lure that we currently use has some sort of built in action , so that even on a straight steady retrieve its active. A stick bait is the exact opposite . On a straight retrieve with no help from the angler a stick bait will come straight back through the water without any movement or action whatsoever. So the whole concept of stickbaiting relies entirely on the angler putting the action into it. Stick baits are often uninspiring in appearance which is the main reason for their slow acceptance among fishermen. They are called stick baits because they have all the features of the ordinary, everyday stick. Having said that, there a few exceptions, that with the addition of fins, scale patterns, eyes and internal reflective prism are remarkably lifelike. Now this might sound all a bit uninspiring but it's not until you get a properly rigged stick bait into the water that you will appreciate their full potential Stick baits are the most devastatingly effective of all the plastics and the most irreplaceable - there's no other lure like them. I can remember standing in a group of people crowded around a TV screen at a Sydney tackle show a few years back. There was a promotional video running , demonstrating the new stick bait. At one stage there was a mid range shot of the incredibly life like lure coming back through the water . I can distinctly remember hearing some of the members of the audience ask the sales assistant if it was a lure or a live bait. From my perspective it was certainly the most life like lure I had ever laid eyes on. The effectiveness of stick baits will be very relative to the skill and creativity of the angler. If you want a lure that you can retrieve mindlessly through the water keep right away from stick baits. They come in a wide range of colours and sizes . Some, like the Bass Assassin range are quite abstract in shape , while others like the DOA Prawn are very lifelike in appearance. Most come bulk packed in anywhere from 5 to 25 to a bag and are generally unrigged. The specialized hooks are purchased separately. 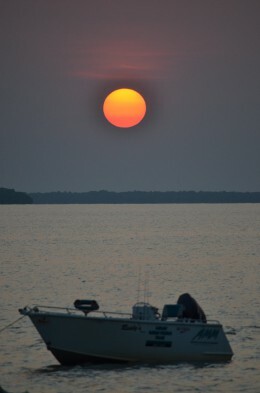 Names to look for include Slug-go , platinum, Mann's Shadow , Doa prawns , Bass Assassin , storm , and Berkley power baits. Making a big impact on the Sydney scene at the moment is the new Tsunami stick bait range. Simply packaged as Stick baits they are currently available in six and nine inch and a wide range of colours. Availability is very good and Sydney harbour Kingfish are going absolutely nuts over them. They are my personal favorites and I recently nailed a 12 kg king on one from the western wedding cake. There's not many fish that won't have a slash at stick bait. 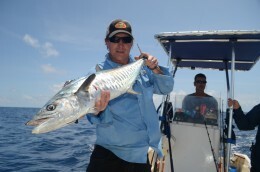 At one end of the scale I can comfortably say that they are THE most effective lure available for Kingfish. At the extreme other end of the scale they are, at best, of limited use on small mouthed species like bream and sooty grunter. Having said that , I've recently been mucking round with tiny stickbaits like the Storm finesse minnow , split shot rigged, on bream and early results have been very encouraging . The problem with your average stick bait on small mouthed fish is with the hook arrangement. Being generally a fairly large hook and sitting well forward in the lure they are more suited to our large mouthed predators. It could be worth mucking around with a stinger hook although in my experience it generally destroys the action and concept. It takes a while to get used to the forward hook placement. Hookup rates are exceptionally good so avoid the temptation to fool around with different hooking configurations and stingers -- I've tried them all with little success. In many cases the hookup and hold rate is superior to conventional lures due to the large gape hooks used with stick baits - how many other lures can you think of that use a 6/0. Furthermore a single hook means all the pressure of a strike is exerted onto one hook point , rather than three as with a treble . While species like tailor and mackerel go nuts over stickbaits , being soft plastic makes them somewhat of a one hit wonder with these toothy critters. In the south of the country prime target species include kingies , Jew , all tuna , ausie salmon , tailor ,and flatties in the salt and Bass , cod and trout in the freshwater. In the north barra and Saratoga in the fresh and barra jacks , threadfin salmon , GTs , queenies and the list goes on in the salt. The best hook on the market for soft plastic stick baits are Mustad ‘mega bite' and gamagatsu worm hooks. There is an 8/0 that is specifically produced for the 9 inch slug-go but unfortunately it is of very limited availability in Australia at the time of writing . The 5/0 megabite and gamagatsu 6/0 will do the job for nine inch lures if you can't source the 8/0 originals , try the 3/0 or 4/0 for the six inch and no. 2 to 2/0 for 2 to 4 inch lures . When selecting a worm hook always look for one with a deep angle in the locking bend just behind the eye. Hooks with a shallow angle will not get a good hold on the lure and will allow it to slide down the shank, bunching up and rendering the lure useless. To work the lures depends on what species you are chasing but in all cases they will require rod and /or reel work. Twitching the lures in a stop start retrieve is by far the most effective way of working them. For fast fish like kingies, tuna or trevally this can be achieved by pointing the rod straight at the lure and retrieving the reel with a series of rapid, stop/start jerks. You will clearly see if the lure is working properly. Don't be afraid to stop the retrieve every now and then and let the lure sink a while. 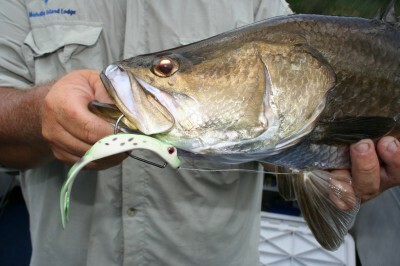 The flat chat retrieve often required for these species, with other lures, is not required with stick baits. The erratic action that we are trying to achieve from our stick baits rely heavily on three critical factors. They must rigged dead strait on the correct sized hook as previously discussed. They must be weighted properly if weight is required (although preferably not) . The critical point in the retrieve is actually the pause after the sweep. This gives the lure the slack line that it requires to veer off its original path. By keeping the pressure on the line the lure cannot get its head and will continue on a path straight towards you. One of the greatest advantages of these pauses and slack line comes about from the way in which many of our target species, particularly natives, feed. It's a well known fact that fish like barra and bass, amongst others, feed by displacing water in a process that sees a vacuum created in the mouth filled by water from outside the mouth, hopefully containing food. A lure on a straight retrieve on a tight line is less likely to be inhaled than one on a slack line. For ambush fish like bass, Barra, Saratoga, Jacks and Flathead the retrieve can be a lot more creative, incorporating work with both rod and reel. Flick the lure into the cover and twitch it about slowly by flicking the rod and twitching the reel at the same time. You will get the feel for it after a while and develop your own style and some amazingly lifelike retrieves. Best rig is with a length of mono nylon trace about a meter long to a swivel and then to the main line. Try putting a small barrel sinker above the swivel or wrapping some strip lead around the hook shank, if you feel you need to work greater depths faster. The sinker above the swivel rig is really most effective for fast retrieves and deep water presentations. It is critical if you choose to weight the hook with strip lead that the weight is placed in a position that maintains the lures horizontal sink attitude. Stick baits can be used quiet effectively on a conventional jig head but this does not exploit their unique attributes. An Alternative to weighting is to cast well up current of the structure so that by the time the lure reaches it it's at the required depth. This requires a lot of practice with the main drawback being that if you get the timing wrong you could end up with your line wrapped around the structure. However, if at all possible, use no weight at all as the stick baits neutral buoyancy is its greatest attribute. Neutral buoyancy means that the lure should ‘suspend' or at worst sink incredibly slowly after a twitch of the rod (Its no coincidence that some of our best ‘suspending' crank baits are neutral buoyancy) This may be possible in still water as you can take the time to let it sink on its own weight but in fast moving water lead will probably be required. Unweighted , a good stick bait should only just sink. This has two main advantages the main one being that it has the natural appearance of a wounded or dead pray. Secondly , they have an amazing ability to be made to twitch and dart erratically in every direction without actually covering a lot of forward distance . This combined with their incredibly slow sink rate allows you to hold the lure in the strike zone for longer which can be an awesome advantage on the slow days. By sliding a willow leaf blade on to the shank of the hook you can alter the sink rate and throw in that highly alluring flash that makes spinnerbaits so appealing to fish . Now your stick bait will rattle and quiver as it sinks, throwing light rays deep into the water. The amount of hits on the fall achieved with this technique is quite outstanding. Flash is the ultimate dirty water weapon. There's no doubt that stick baits require a lot more attention in both the rigging and presentation department but the effort is well rewarded with more fish.